We start this packed programme of Yorkshire Buses in the city of Leeds, with some archive video from the camera of local bus photographer, Malcolm King. Filmed during the late 1980s and early 1990s we see Yorkshire Rider owned Metrobuses, Leyland Atlanteans and various mini-buses in service. The Volvo CityBus B10M (C101 CUL) is seen operating with Black Prince, though still in its former owners (A1 of Ardrossan) blue and white livery. This bus was originally new to London Transport. We also see Gold Rider liveried Leyland Olympians entering Leeds bus station and a former Leeds City Transport Roe bodied Leyland Atlantean sporting Christmas lights! A former West Yorkshire Leyland Olympian, 5187 (FUM 487Y) is seen in Tilling red livery extolling the virtues of Yorkshire Rider having been acquired in 1990. A depot scene features preserved Leeds City Transport, AEC Regent I, 106 (HUM 401), as well as DAF Optare Deltas leaving for service. We now move forward some 25 years to see the buses in Leeds filmed by independent transport videos own cameras. The scene has changed beyond recognition! Current big operators are First West Yorkshire, Arriva Yorkshire and Yorkshire Tiger (owned by Arriva). Also seen are the Transdev operations of Yorkshire Coastliner, Harrogate & District and Keighley & District, each with their own distinct liveries. Arriva also have their higher end branded services, namely ‘Sapphire’ and ‘MAX.’ There is also a wide range of vehicle types, including Wrightbus bodied Volvo B5LH hybrid double deckers in a silver and pink livery operated by First and a two tone green livery on the ones operated by Arriva. Some Optare Spectra DAF DB250 double deckers can still be seen in service with Arriva. First run their Wrightbus StreetCars on the Leeds to Bradford trunk route branded as ‘Hyperlink’. We also see the erstwhile Yorkshire Rider livery revived on First’s Volvo B9TL 7674 (YJ58 RTV). Our filming takes place at a wide number of locations. Some of these include York Street, St Peter’s Street, The Headrow, City Centre Loop, Duke Street, New Market Street, Boar Lane, Leeds bus station, City Square and Vicar Lane. We also briefly visit Hunslet, Elland Road Park & Ride and see the York Road guided busway. The second part of this programme takes us to York. Again we start with some of Malcolm’s video footage where we see mini and midi buses of Target Travel and Reynard-Pullman operating in the early 1990s. Reynard-Pullman was taken over by Yorkshire Rider in 1990. Mini-buses operated by the former West Yorkshire are branded ‘Hoppa’ and we see their Leyland Lynx and Olympians now with York City & District fleet names. Coaches operate the Park & Ride service. We see a brand new Alexander bodied Leyland Olympian in Yorkshire Rider livery as well as a former West Yorkshire Bristol VRT in that livery but with York City & District fleet names! Twenty-five years on a lot has changed! Current operators are mainly First, Arriva and Transdev. Park & Ride services are now operated by electric Optare Versa V1100EV single deckers alongside articulated Mercedes-Benz O530 Citaros and standard Volvo B7RLE Wrightbus Eclipse Urban single deckers. The smart Transdev Yorkshire Coastliner buses are also seen alongside many more types, but you will have to watch this DVD to find out! Our filming locations are in Station Road, Queens Street, Leeman Road, Piccadilly and Coppergate. 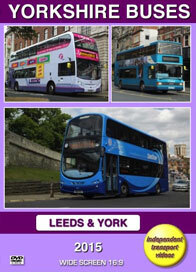 We hope you enjoy this Yorkshire Buses programme. More will follow as we take you around the interesting county of Yorkshire!